Make your garden beautiful with fantastic patio furniture. Walmart sells a market umbrella for only $29.84 this week. The deals are effective until Apr 13. 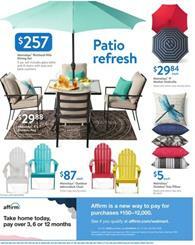 Modern and comfortable products are available in the patio sale. It's possible to find beautiful and relaxing furniture for backyards. Walmart's latest ad also covers garden power tools. Greenworks push mower, high-wheel push mower, and many more are going to be available. New tools like ride-on mower are available on sale. Pay only $367 for the new Snapper 22" 3-in-1 high-wheel push mower. Ozark Trail Llama chair, 3-person dome tent, character sleeping bag, 17-oz. enamel mug and more are the covered items. If you are planning for a trip into the wild, check out the latest Walmart Ad. Moreover, follow our Facebook page, subscribe to the newsletter to get emails. Find all other products in the browsable Walmart Weekly Ad. Many more categories and products are available in the sale.